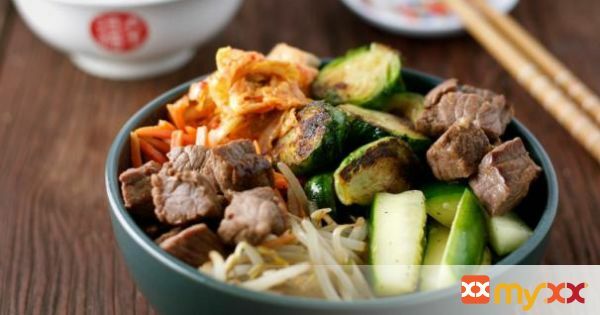 Bibimbap is a delicious Korean Dish full of vegetables, meat, and sauce. This is our Bibimbap (The Hubby’s Recipe)…. With his sauce and marinade I would love for you to try! 3. While waiting to cook the meat, mix the garnish sauce ingredients together and set aside. 4. Once ready to cook the meat, add about a tablespoon of sesame oil to a pan (I like to cook this dish with a wok). Get the pan really hot using medium high heat. 5. When the pan is hot, remove the meat from the marinade and add the meat to the pan. 7. Remove the cooked meat from the pan. 8. Add about another tablespoon of sesame oil to the pan and let the oil get hot. 10. Remove carrots from pan and set aside. 11. Add a tablespoon of sesame oil to the pan, and once the oil is hot, add the bean sprouts. 12. Cook from about two minutes. 13. Once the bean sprouts are cooked, remove them from the pan and set aside. 14. Add a tablespoon of sesame oil to the pan, and once the oil is hot, add the sliced cucumbers. Cook the cucumbers for about one minute. 15. Add about 2 tablespoons of sesame oil to the pan, and once the pan gets hot, add the brussel sprouts to the pan. 16. Cook the brussel sprouts for about 7 minutes. 17. In small frying pan, add an egg and fry to desired doneness. (In a traditional Bibimbap, they are raw, as well as the vegetables, but I like to cook my eggs over easy). 18. Plate a scoop of rice in each bowl. Then, add the vegetable giving each vegetable it's own section. 19. Garnish each bowl with a cooked egg, kimchi, and sauce.